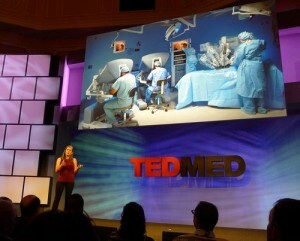 The TEDMED conference took place last week in San Diego, but it has taken me this long to digest all of the content and follow up on all the connections I made there. The general theme of the conference can be summed up in two sentences: There are amazing advances coming in medical technology. These may or may not make it through the FDA approval process in time to save your life. • Eythor Bender of Ekso Bionics demonstrated an exoskeleton that allowed a paraplegic to walk. • Daniel Kraft showing what medicine can learn from other fields such as aviation. • Lance Armstrong describing the decisions he and his doctor needed to make in treating his cancer. • Quyen Nguyen of UC San Diego, showing a video of a fluorescent dye that binds to tumor cells to make them more visible during surgery. • Diana Nyad describing her attempt to swim from Cuba to Florida and her encounters with box jellyfish. • Paul Stamets on medicines derived from mushrooms. • Gabor Forgacs of Organovo demonstrating an inkjet printer that was modified to “print” organs from a supply of cells. • Yoav Medan of InSightec describing one of the breakthroughs that did get FDA approval: a device that uses focused ultrasound to do surgery without making an incision in the patient. • Dean Kamen describing his frustration in trying to get FDA clearance for a robotic arm he developed for war veterans. • Nate Ball, an engineer and beatbox artist demonstrating how he makes all those sounds. On stage. By having Dr. Nguyen thread fiber optics through his nose so we could see an image of his vocal cords as he made various sounds. • Charles Pel of Physcient describing a new model of retractor that uses force sensors to back-off before it damages bones or tissue. Next year, the conference moves to Washington, DC. In a move that can only be described as audacious, Jay Walker plans to double the size of the conference and take on the DC establishment. If anyone has the enthusiasm and resources to do it, it would be Jay. Check out more photos of the event here. The Health 2.0 conference returned to San Francisco for the fifth year, with a record-setting attendance of 1,500 this time around. 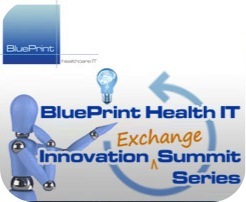 The zeitgeist continues to be that of information technologists eager to fix all the problems of healthcare. With 35% of doctors carrying iPads and 85% with smartphones, there is plenty of opportunity for technology, but this year, there was also a closer attention to payment models and to incentives for use, both financial and psychological. 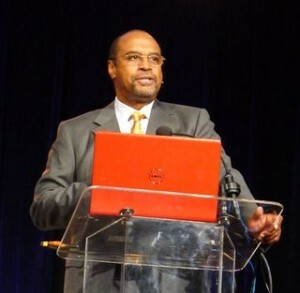 In his keynote, Mark Smith, President of the California Health Care Foundation, said that while technologies such as the Internet had transformed banking, travel and research, medical consultations were still being done the same way they had for the past 50 years. However, it is not enough to provide technology. He stressed that he wanted to fund projects that incorporated financial models that would encourage use. He said too much of what he’s seen in the past resembled the Underpants Gnomes of South Park, with business models consisting of 1. Invent Widget, 2. ??? ?, 3. Profits! Smith said that the most important element of any new initiative was that it reduce costs, not just by shifting them around, but by reducing the “perverse incentives” that encourage volume above all else. Other opportunities lie in improving convenience to patients, rapid learning for providers on how to make sense of the increasing volume of data and enrollment for the uninsured. As an example of how this could work, he cited how Kaiser-Permanente’s introduction of Electronic Health Records reduced specialist visits by 25%. • GE Intel Care Innovations home monitoring and communication system.